​​If you enjoy our July Australian Education News please use the Forward button in the footer section to share it with colleagues and friends. Out of sight of all the warrior-like rhetoric there are peacemakers working quietly to influence the formulation of good policy with the tools of calm and reasoned argument. ACSSO is one of them and is now looking to the future. I write this as we see the weather maps turn a deep blue as a creeping cloak of frigid weather makes its way up the east coast towards our shivering Sydneysiders. One can only hope that on its way over Canberra, it will also cool the temperature of the furious rhetoric that has surrounded the passage of the Australian Education Amendment Bill 2017. As the national public school parent body ACSSO has approached the issue of education funding in good faith, and an absolute focus on policy over politics, with its longstanding call for Fair, Simple and Transparent, and truly needs based funding with no special deals. Following the Senate inquiry into the Bill the Greens, the cross benchers and their parties negotiated with Government to define amendments that could improve the Bill by delivering its changes within a shorter six-year time frame with additional funding, the forming of an Independent body to review funding levels and binding the states and territories into delivering their fair share of funding into public schools. Education funding is a highly complex wicked problem with no right or wrong answers – only better or worse outcomes. What has been branded as Gonski 2.0 is now enshrined in law with its passage through the Senate. What it has done is to produce a model that has finally brought an end to the 27 separate funding agreements interlaced with special deals and other peculiar adjustments that gave an unfair advantage to a number of private sector schooling providers. Whilst not perfect, it’s a significant step forward in moving us all closer to the potential of an outbreak of peace in the education funding debate. Out of sight of all the warrior like rhetoric there are peacemakers working quietly to influence the ongoing formulation of sound policy with the tools of calm and reasoned argument. ACSSO is one of them and is now looking to the future where good policy ideas have to be put forward and the argument won for the benefit of public schools. What lies ahead of us is to observe the forming of the independent body that will explore the suitability of the current Schooling Resource Standard together with the six additional needs based loadings to address disadvantage. ACSSO is continuing with its longstanding call for this group to review the the needs based funding formulae in light of a single national model. Needs based funding to address disadvantage must go to where there is greatest need and the formulae must address the extreme need that exists in particular communities across our nation – needs that cross state and territory boundaries. There is a common expectation of this body’s potential to significantly de-politicise the needs based funding policy with an objective appraisal that must be truly independent and not subject to party-political or jurisdictional influence. ACSSO would further exhort this body to look closely at true need versus subjective want; it must also be in a position to offer recommendations to government, both present and future, that may result in future legislative change. Such changes may be necessary to properly utilise whatever funding provision is made available by governments and not to be influenced those best able to lobby for their sectorial interests. We need a truly needs based Schooling Resource Standard funding formula and appropriate needs based loadings for a single national funding model- ideally utilising the new transparency provisions of the Act - that may well result some schools being ineligible for government funding. The current means based eligibility criteria for the aged pension might offer a suitable policy precedent. This, together with David Gonski AC’s ‘Review to Achieve Educational Excellence in Australian Schools’ or what we know as Gonski 2.0, will occupy ACSSO’s interest for some considerable period. The members of the review panel have been announced is now due to report in March next year with further discussions with states and territories, via the COAG Education Council, to negotiate, agree and implement its recommendations. Looking to this time next year I hope that we’re in a position to reflect on the Prime Minister’s words from his pre-budget announcement alongside David Gonski AC and his Education Minister when he declared that the intent of the Quality Schools initiative, and the Bill that would frame it, was to produce ‘Great schools, great teachers and great outcomes’. By then we may well be approaching a new electoral cycle and in a world of political slogans it’s a great one to hold the politicians across all jurisdictions entirely accountable for. I think we’d all struggle to find a parent that wouldn’t want this for their child and the potential it offers for our wider community; especially the vast majority of us that have actively chosen public schools as the first choice for our children’s future. With half yearly report season upon us, here are a couple of videos which may assist in making the process of parent–teacher conversations more effective. One of the first actions of ARACY's new Australian Parent Engagement Network (PEN) is to share this survey for the Australian Sports Commission. The survey is designed for parents and carers of children aged from birth to 13 years. This survey is being conducted on behalf of the Australian Sports Commission to help them understand how to better engage families to ensure children enjoy the benefits of active childhoods. 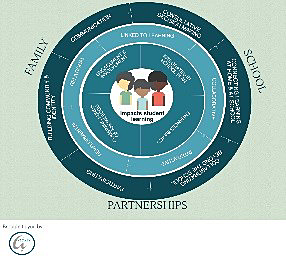 The Family Engagement Circle brings together current effective practice in the area of family engagement into a simplistic tool which can guide the development of effective practices and programs which enhance partnerships. Our Family Engagement Continuum is based on the work of Dr Karen Mapp and describes how family engagement in schools is a journey with everyone sitting at various places along the journey. The continuum allows for a visual representation where a school sits and where areas of improvement can be made to move along the continuum.